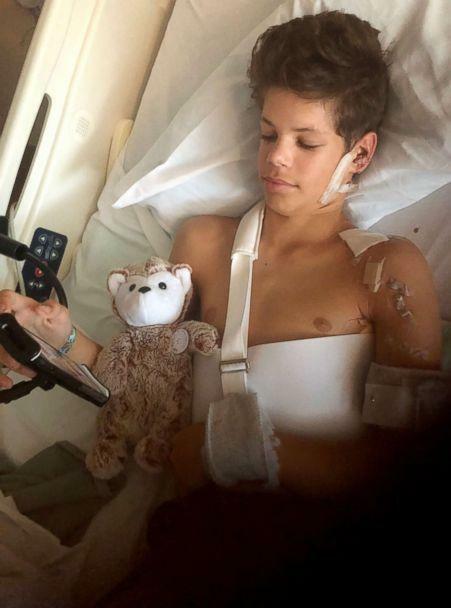 Keane Webre-Hayes remembers "everything" from his bout with an 11-foot-long great white shark, but said when the predator first "tackled" him he thought it was his friend playing around. The sun was rising early on Sept. 29 at Beacon's Beach north of San Diego as Webre-Hayes was paddling in the 9-foot deep water with a friend and taking in the view when he noticed a kayaker and plunged down in hopes of catching a lobster. "I dive down and I [didn't] get the lobster, sadly, but as I'm coming up I feel something just tackle me and it took my mask off," Webre-Hayes said in an exclusive interview on "Good Morning America" Thursday. "At first I thought it was Noah trying to mess with me and trying to scare me because then I come up and my mask is off. I'm all confused and I look over my wetsuit is all ripped up and blood is starting to go into the water." He spotted his friend's snorkel still in the water, realized what was happening and said that his instincts kicked in. "Just by instinct I just started swimming to that kayak as fast as I can and I'm screaming for help, 'Help, shark,'then I swim to the kayak. I pull myself on and I told the guy we have to get to shore," the teen recalled. He was rushed to shore by lifeguards and local kayakers, then airlifted to a hospital. His mom, Ellie Hayes, said she was on a bluff above the beach on the phone with her husband, the teen's stepfather, when she heard screaming in the distance. "The sun was coming up and it was kind of an eerie feeling out there. It's super quiet and I was on the phone and in the background, I started hearing probably just the worst screams I've ever heard in my life," Hayes said. "I stopped to listen and I couldn't tell if it was Keane or someone else and my husband actually said to me at that time, he said, 'Oh, it's probably just Keane getting eaten by a shark,' -- he was joking because [what are] the chances of it really happening and it was just a few minutes later that I heard the bellowing yells of the men yelling shark, get out of the water and I just bolted for the beach to find him." 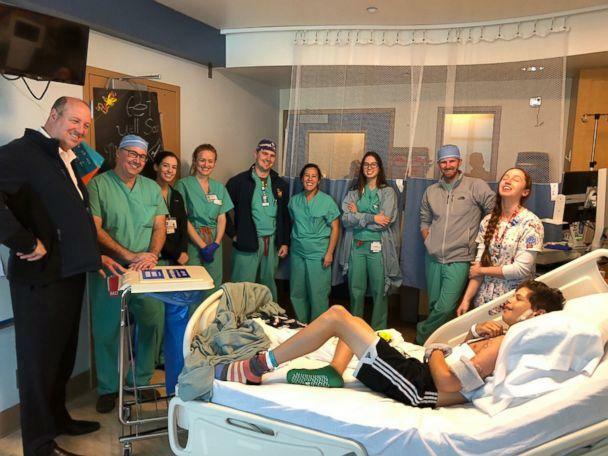 Keane was in critical condition upon arrival at the hospital and underwent five hours of immediate surgery with Dr. Tim Fairbanks, the hospital's chief of pediatric surgery. Luckily for Keane, doctors said the shark's teeth missed all of his major arteries and nerves. Still, Fairbanks said the teen would have a long road to full recovery. "It's been a lot of work, life-changing for sure," his mom said. "It is a constant bandage-changing, just getting through all the doctors, trauma therapy, orthopedic surgeons, infectious disease -- it's really rocked our life as we know it. We're getting the new normal." Despite the terrifying ordeal, Keane said he is "feeling great" and will "definitely" be back in the water to lobster dive once he's fully recovered. Hayes said the outpouring of support from their family, friends and community has been "amazing." "I never knew that it would be overflowing the way it is. This is one of the most tragic things that our family has gone through. We're happy Keane is alive, but we have a long road ahead," she said. A close family friend, whose daughter is in his class, set up the Keane Hayes Encinitas Shark Attack GoFundMe page to help contribute to the family’s mounting medical bills that Hayes said they "weren't prepared for." ABC News' Jim Vojtech and Maria Villalobos contributed to this report.